Decide what function the room will serve. It will probably help keep the peace in your family if you ask your spouse and kids for input. It doesn't have to be a single-purpose space. 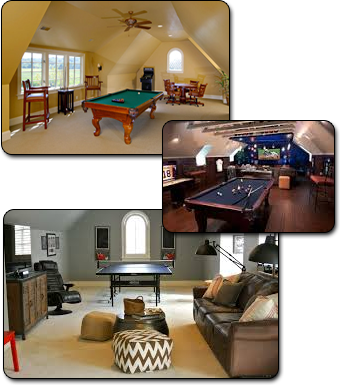 A large bonus room can easily be divided into more than one purpose-driven area with a little design know-how. The wise folks at WiseGeek.com note that large families typically end up turning their bonus room into a family room where everyone can kick-back and relax, leaving the actual living room reserved (and clean) for guests. Having a family room in addition to a living room can take a great deal of pressure off of the person in the household who is responsible for cleaning. If your bonus room is on the large side, it can be a home theater the ideal site for the giant plasma screen that you dont want consuming all the wall space in your living room, the game console, stereo and iPod docks. Or, if its on the smaller side, call it a media center. Either way, outfit it with comfy couches or beanbag chairs, a mini-refrigerator and a microwave for fresh popcorn. Budget permitting, include a small sink so you dont have to carry dirty dishes to the kitchen. Baskets for organizing remotes and DVDs will help corral creeping clutter. Add a poker table and chairs, shelves for board games and supplies, and youve got a dedicated game room. If its a large enough space, you could include a pool table or ping pong table.